The fourth album from this British band. The band continued on with some good success in USA, UK and Canada. The band was again a five piece band with keyboards, bass, drums, guitars and vocals. The female vocals of Janita Haan is off course present here. 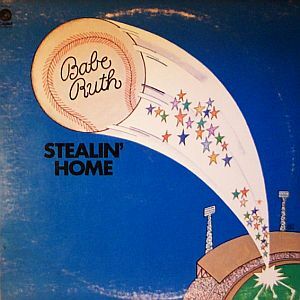 But I did not know that the UFO and Whitesnake guitarist Bernie Marsden also played on the final two proper Babe Ruth albums; this one and the follow up. The guitars are pretty heavy. The music is boogie and heavy metal. There is nowhere to hide this fact. There is also a lot of blues and hard rock here. The keyboards and piano is honking away in the background. The music is pretty much vocal chords breaking and Janita Haan sounds a bit strained and worn on this album. This is not music for female vocals. This is not music for her vocals. There is still a lot of quality in this band despite of the not so good songs this band is having to perform and record here. They manage to get a forty minutes long decent album out of this. The songs are quite decent throughout and the musicians does what they can. The hard rock here is a bit naive and innocent sounding. It is still an album I can do without and I will pass over their final two albums. This is a decent album from a band whose first album was a good one and the rest of their albums not so good.